PALAZZO PALETTA DAI PRE': INVESTING IN ART WITH THE SOLIDITY OF REAL ESTATE Visit an important aristocratic mansion located in the historic center of Verona: surround yourself with the most important artists of the eighteenth century in Verona and discover an italian masterpiece to pass on the future generations. Guided Tours, upon booking, will allow to know this prestigious mansion decorated with frescoes and paintings of the most important artists of the eighteenth century in Verona, like Giambettino and Gaetano Cignaroli, Pietro Antonio Rotari, Carlo Salis and Giorgio Anselmi. Located in the historic center of Verona, the mansion, that is for sale, has been recently restorated. The status of the work allows the customization of finishes for both residential purposes and for an eventual office use. The building, which was completely transformed by its 18th century owner, Pietro Antonio Serpini, conserves a stunning portal in Via Arcidiacono Pacifico dating from the last 15th century. The finely-engraved hard-stone portal, which is attributed to Domenico da Lugo, is considered to be the most beautiful portal in Verona. A large entrance leads into the inner court yard, to which access can also be gained from Via Barchetta at the rear of the building. On the right, a large mullioned tufo-stone door affords access to the manin stairway leading up to the noble floor. The staircase is adorned with statues and stuccoes. The main hall contains two large paintings on the walls depicting "The Sacrifice of Iphigenia" by Pietro Rotari and "Achilles drags Hector's body" by Carlo Salis. The same hall contains, besides painted architectural elements, a series of monochrome frescoes depicting scenes inspired by th Illiad and Aeneid by Giorgio Anselmi painted in 1765. In the hall on Via Barchetta, on the walls, there are eight still lifes with flowers and fruit painted on canvas that are unique in Verona. 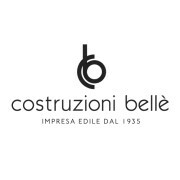 Costruzioni Bellè S.r.l. is family-run firm specialised in the restructuring and restoration of historic buildings. It was founded by Cesare Guido Bellè in 1935 and was subsequently run by Nazareno, his son and now by Guido and Damiano. The firm’s main line of work has in recent years been coupled with business in the real estate sector, with the purchase, restoration and sale of prestigious buildings located in Verona.